Clean, plenty of space and a very comfortable place to relax after busy days in Tokyo! Location was great. It was near enough to shinjuku that we could walk there and yet far enough such that we were not overwhelmed by the glitzy, over-crowded shinjuku. I like that we had a fairly well equipped kitchenette and we could heat up our food and we could also bring home our dinner to eat in our room. Room was bigger than the normal tiny rooms that other hotels offer. 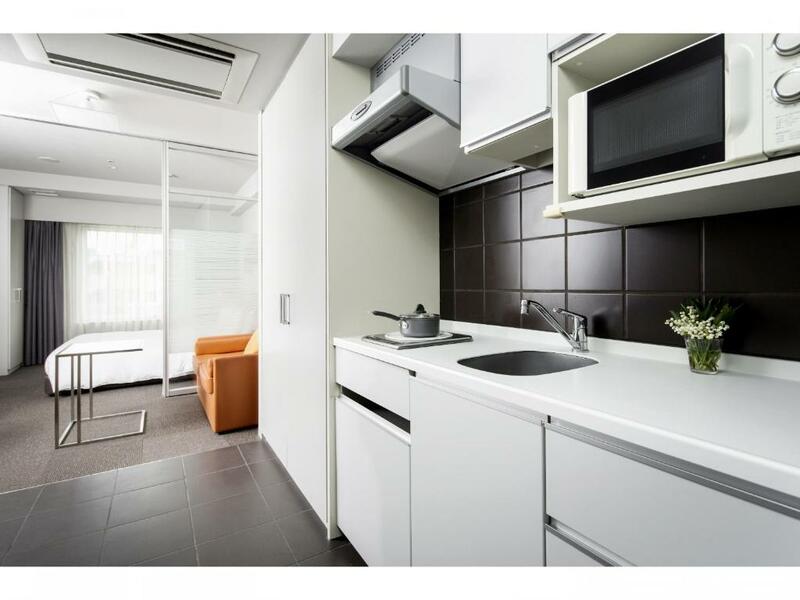 The location is great- about 500 meters from the metro station and about a 15-20 minute walk from Shinjuku train station. It was nice to be able to walk to the station to take the train to Hakone for example. This is a great place to stay in Tokyo. It's very near to the bustling and noisy Shinjuku station such that we can walk there very easily and yet it's relatively quiet. And when we have our luggage, Taxi to Shinjuku station cost about 750 yen. There's 7 eleven and Lawson grocery a stone throw away. 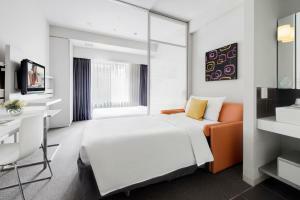 The rooms are large by Tokyo standard and yet affordable. I like the little kitchenette that comes with what I need to cook Japanese instant noodle. Service provided was good. I asked for 2 extra pillows on the first night and they were brought to my room very promptly. And on the 2nd day, we were provided 2 additional pillows by room service. I'm delighted that the staff was mindful and attentive to our need. This place was super clean and nice, the beds were comfy and the staff were so nice. The spacious room. Big window. Serviced daily. Appliances in the room had English manuals and we're easy to operate. Staff was helpful & accommodations met expectations. Apartments compact but very well designed and well equipped. Spotlessly clean, modern apartment/room with adequate kitchen for short stay. Lots of storage. Beds very comfortable and lovely duvets and sheets. Bathrooms well equipped. Desk and armchair handy. Wifi great. Fabulous location. Lots of local restaurants, cheap eats and shops and a short walk to beautiful National Park and to Shinjuku where all the shopping, night life and action was. We loved our 2 night stay here. Felt very safe walking at night. Cat cafe nearby - kids loved it. We didn't try the breakfast - local Starbucks worked for us! Small but well designed apartment, comfortable bed and lovely bedding. Lots of hot water. Nice lobby. Helpful staff. Great location for walking Shinjuku. Spotlessly clean. 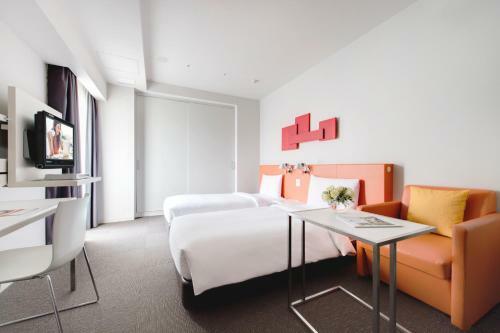 Lock in a great price for Citadines Shinjuku Tokyo – rated 8.8 by recent guests! 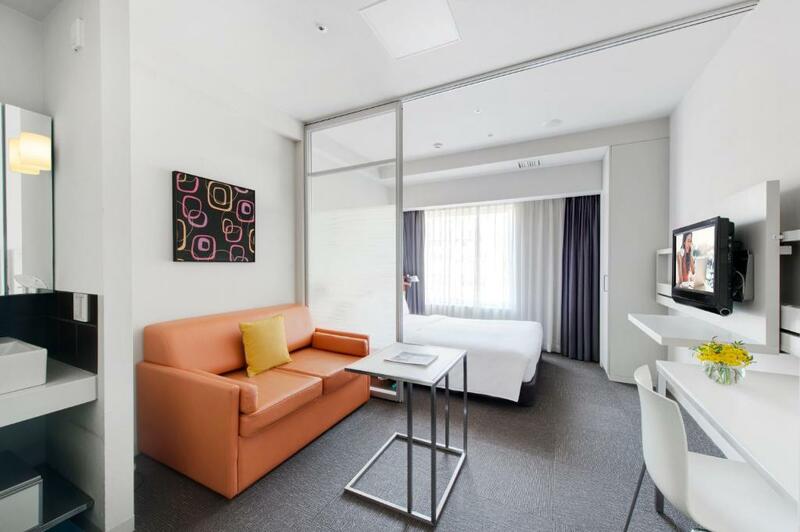 Citadines Shinjuku Tokyo This rating is a reflection of how the property compares to the industry standard when it comes to price, facilities and services available. It's based on a self-evaluation by the property. Use this rating to help choose your stay! One of our top picks in Tokyo.Featuring a 24-hour fitness room, Citadines Shinjuku Tokyo is just a 5-minute walk from Shinjuku Gyoenmae Subway Station and a 7-minute walk from Shinjuku-sanchome Subway Station. 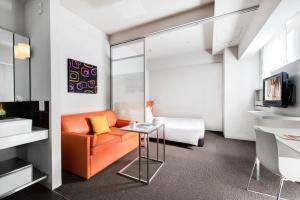 This design hotel offers studio apartments with free WiFi and wired internet access. Citadines Shinjuku Tokyo offers daily continental breakfast, served in the breakfast lounge. This hotel was selected as one of the Top 25 Hotels in Japan by TripAdvisor's Travelers' Choice Award 2014. Shinjuku Tokyo Citadines provides coin-operated laundry facilities. Guests will find drink vending machines and a 24-hour front desk with luggage storage service. Paid parking is available on site. 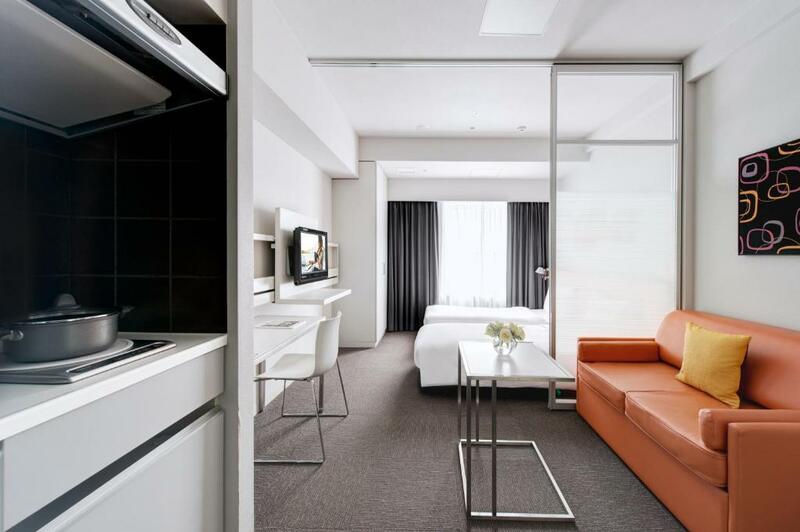 The air-conditioned studios at Shinjuku Citadines Tokyo boast a smooth modern style. The fully equipped kitchenette features a variety of cooking utensils, cutlery and tableware, while the private bathroom comes equipped with a bath and shower. Free toiletries, a hairdryer and slippers are provided. Guests can enjoy DVDs on the flat-screen TV. For their convenience, guests will also find personal lockers and ironing facilities, as well as a seating area and desk. Shinjuku Gyoen National Garden and the Isetan Department Store are a 10-minute walk from the hotel, while the lively Kabukicho district is a 15-minute walk away. Shinjuku Gyoenmae Subway Station offers direct subway access to the Ginza and Shinjuku areas. When would you like to stay at Citadines Shinjuku Tokyo? The air-conditioned studio features a smooth modern style. The fully equipped kitchenette features a variety of cooking utensils, cutlery and tableware. The private bathroom comes equipped with a bath and shower. Free toiletries, a hairdryer and slippers are provided. Guests can enjoy DVDs on the flat-screen TV. For their convenience, guests will find personal lockers and ironing facilities, as well as a seating area and a desk. A sofa bed will be prepared for a 3rd guest, only when the booking is made for 3 people. Please indicate the correct number of guests at time of booking. Private parking is available on site (reservation is needed) and costs JPY 2700 per day. House Rules Citadines Shinjuku Tokyo takes special requests – add in the next step! Citadines Shinjuku Tokyo accepts these cards and reserves the right to temporarily hold an amount prior to arrival. Directions: From Shinjuku-Gyoenmae Subway Station, leave from Exit 2. Go left and turn left down the first street you encounter. Continue straight for 1,000 feet until you come to a larger road (called Yasukuni-Dori). Turn right and continue for 150 feet. The hotel will be on your right. Please note that the hotel will undergo a scheduled power outage due to facility inspections and electric facilities including WiFi, air conditioning, elevators and hot water supply will be out of service on the following dates/times: 07 May 2019, 12:00-15:00. Great location, 10 minutes walk to Shinjuku shops and eating, 5 minutes to a really great park, short walk to local restaurants and sub way. 7 eleven 1 minute away with a ATM that handles multi languages and foreign cards. Rooms are cleaned every day, room had small kitchenette, shower toilet etc plus sofa and small table. Always 2-3 staff on reception who were very kind helpful and patient. If you are going to the Kusama museum there is a public bus stop on the opposite side of the street from the hotel that goes to the museum 5 stops very easy. This hotel was very quiet. It’s a little far from the railway to drag bags but once there it’s a joy to walk around the area. Although a bit far from the subway, in all other respects it’s a great place - incredibly well equipped room, cleverly designed. Staff are excellent with good English. Brekky is ok but not wonderful. Small alley right beside the hotel offers many really great little cafes and restaurants. Better than many 5 star swanky joints. Great large room perfect for a young family. Close to the subway station and gardens. Surrounded by heaps of awesome little local restaurants. Big room with many facilities. Only two gripes: - The cleaner threw away my earplugs on the second-to-last night, which was a pain as I had to go find new ones to buy. - The washing machine cycle either wasn't long enough, or no washing liquid came out, as my clothes were still dirty when they came out, but I didn't notice this until they were dry, so the whole wash/drying process was a waste of precious holiday time. Great room, good sized room, it was nice to have a couch. Black-out curtains and quiet. Very comfortable bed. Good housekeeping. Nice bathroom and shower. Mostly friendly staff, just one gentleman who was on one night shift was a little dismissive, but everyone else was lovely. Great location, only 10 - 15 mins stroll from town, nice to be near but not right in all the hustle and bustle. Very clean, tidy and comfortable place to stay. Staff are excellent and always welcoming. Great staff. Very clean. Well organized. Worth cost.. Location is fine, right on the end of Shinjuku.. not necessarily an easy place to return to throughout the day. 5-10min walk from the nearest subway station. We had only one pillow each when we first checked in. I needed two pillows. But room service was great - we were given another pillow when we asked for them. Big rooms, clean, great beds. The location is very good as it is near Shinjuku area and yet away from the hustle and bustle. Many local restaurants around with very good and cheap food. The room is spacious as compared to other Tokyo hotels. Great for families with babies! The housekeeping staff even washed our dirty utensils!! Great service & excellent experience!